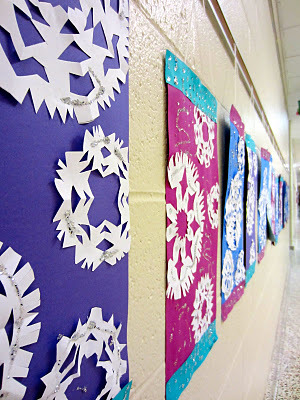 I love this idea for decorating with Kirigami snowflakes. Instead of just hanging them from the ceiling or taping them to the wall, create fun snowflake banners by attaching them to brightly colored paper. These would look great above your mantle, behind a dessert table, or you can make a tiny version and use them as bunting on a garland. You can see how to make Kirigami snowflake banners over at Dali's Moustache. all the pictures on your site are soooo cute!